Police officers shot and killed Rafael Laureano while aiming for another man, officials said. BROOKLYN — A man trying to protect his girlfriend and her kids from a knife-wielding attacker was shot and killed by police, an autopsy shows. 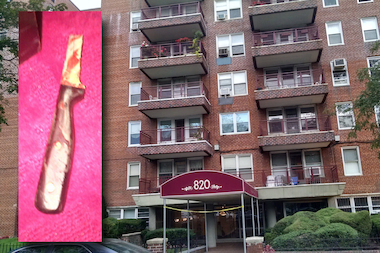 Rafael Laureano, 51, had brought police to his girlfriend's seventh-floor apartment at 820 Ocean Parkway about 7:20 p.m. where her ex-boyfriend, 47-year-old Francisco Carvajal, was threatening to hurt her with a pair of knives, sources said. The girlfriend, 35-year-old Kathy Russo, was hiding in the bathroom with her two kids, a 7-year-old boy and a 6-year-old girl, she and police said. When police and the boyfriend arrived at the apartment, Carvajal lunged at Laureano prompting the officers to open fire and hit both men, sources and officials said. Laureano was killed by a bullet that pierced his back, according to the city's medical examiner's office. He was taken to Maimonides hospital and pronounced dead, police said. NYPD officials initially said Carvajal had stabbed him multiple times, but his body showed no stab wounds, sources said. Carvajal was pronounced dead on the scene after police bullets punctured his heart, lungs, liver and intestines, the medical examiner's spokeswoman said. Russo managed to keep Carvajal at bay even though the lock to the bathroom she was hiding in had broken, she said. "We're all right, all things considered," Russo said, after the deadly encounter. "The kids are not physically harmed, which is good. They saw everything." Neither she nor her kids required any medical attention, officials said.